It is interesting to observe the content of this ad. Quite obvious is the statement that the Vanguard movement is "The Latest and Greatest Achievement in Watchmaking". Less obvious but equally as interesting is the smaller print. 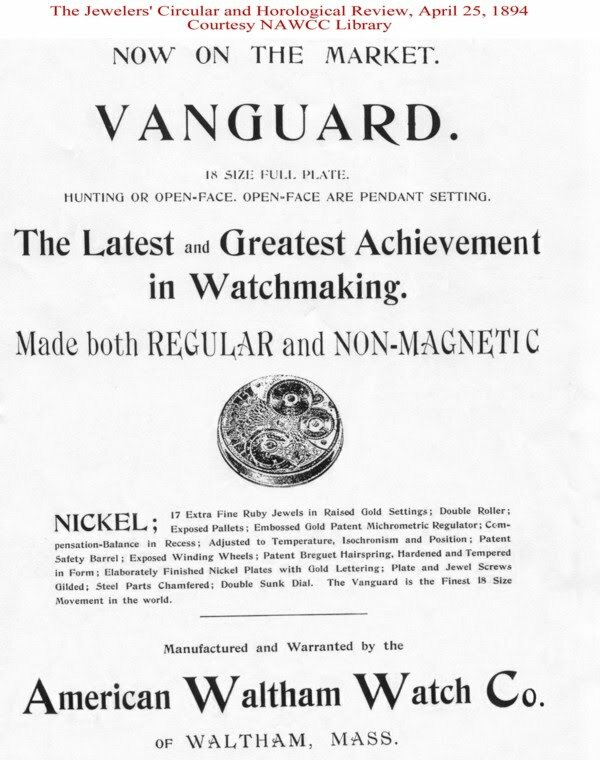 The ad clearly states the Vanguard movement to be a 17 Jewel movement. It should be remembered that the Vanguard movement was introduced just after 17 Jewel movements were becoming the standard for a quality movement (up from 15) and after Hampden had begun making a 21 Jewel movement (1890). Being that the first two runs of Vanguards in the Gray Book are listed as 17 Jewel movements and 21 Jewel movements have also been reported from these runs, one wonders about how Waltham perceived the impact of the 21 Jewel movement on the market. Tables containing movements reported from the first few runs of Vanguards can be found here. Also in the "small print" is a fairly detailed description of the movement, not only in terms of visual aspects but also the technical aspects. It is difficult to imagine such indepth descriptions of a modern watch. At the end of the small print a boast, "The Vanguard is the Finest 18 Size Movement in the world".